Happy Monday to you! I hope you had a great weekend :) Today, I'm sharing a super simple quick trick as part of Amy Smart's Quick Quilting Tips & Tricks blog hop to celebrate the release of her new book Fabulously Fast Quilts ! It's a simple trick that I use every day in my sewing room: finger pressing! As a little girl, one of the girlie things I got into early on was nail polish. I actually got into some serious hot water one afternoon when I spilled half a bottle of glitter nail polish all over my mother's formal living room coffee table. My older sister was supposed to be watching me, but she didn't see me make a bee-line for her glitter nail polish, not until it was too late. My obsession with nail polish continues to this day - while I may be lax about getting my hair cut, I like to take care of my fingernails. Always have. I get manicures regularly, it's my "me time" - and I've found that in sewing, it's super handy to have my nails well taken care of, because I can put them to use finger pressing. Do you finger press your seams? I'm a frequent finger presser. In paper piecing, there's a good bit of pressing involved - really, you ought to press every single seam you make with a nice, hot, dry iron. I do a lot of paper piecing, and I often cheat with my seams, finger pressing them rather than pressing them with the iron, if I'm waiting for the iron to heat up, or if I'm just being lazy, which happens frequently in my sewing room. Finger pressing also works great for speeding up regular pressing. I often press assembly line style, laying out a bunch of pieces to be ironed all at once. This process is made way easier by finger pressing the seams first, so that I don't have to spend any time setting up the seam to be pressed. It works well for both side pressing and open seam pressing, so you can do whatever floats your boat. If you aren't one for having longer fingernails, you can still take advantage of finger pressing using a notion called a Finger Presser . It's a little wooden tool that you can use in lieu of a finger nail to finger press your seams. In one of my recent paper piecing classes, I met a student who bites her finger nails and swears by her finger presser because her finger nails are never long enough to put to work in this way. 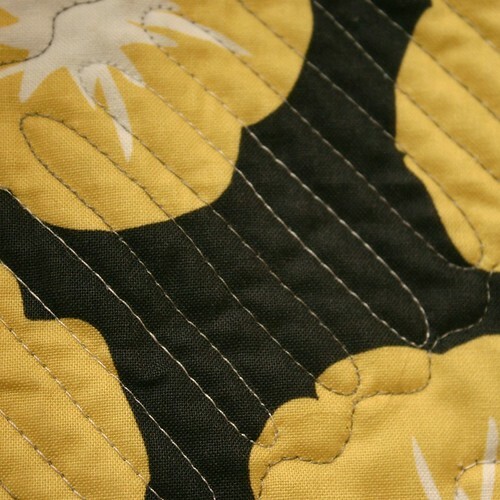 Also today, you can listen to me chatting with the wonderful Pat Sloan on her weekly American Patchwork & Quilting podcast - it's always such fun to chat with Pat, and this time we chatted a bit about free-motion quilting, so check out the podcast at 4 o'clock Eastern time today right here/1 o'clock Pacific time. You can also check it out after the fact, as well as other past podcasts right here. Pat's show is great to listen to while you're sewing, so make sure to check it out! So you're free-motioning, and things are going well at first...until blam - a skipped stitch! Or blam - thread breakage! What do you do? Follow these tips and tricks below and I feel sure you will find the answer to your problem. 1. Change your needle. If it's been on there a while, it may be worn out. More often than not, a new needle will fix things up for you. Free-motion quilting puts a lot of stress on your needle, and it's more prone to bend or warp during free-motion quilting than when piecing. I try my best to remember to start each free motion project with a fresh needle. 2. Cut both your bobbin and top threads and rethread both. Dig out your manual for this one, and follow the directions step by step. One of my FMQ students had been using her machine for over ten years, and threading it improperly all along! 3. Clean out your machine. Take out your bobbin and clean the bobbin case throroughly. Keep your eyes peeled for stray threads, too. Use a tweezer to grab any stray threads you find. 4. Try a bigger needle - your needle may be too small for this. Ultimately, this has been the biggest solution with my Juki. 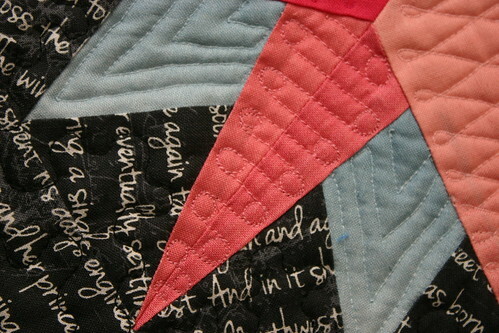 I'm now using a Topstitch 100/16 Needle for FMQ on the Juki, which seems to work best. It has a much larger eye than the 90/20 needle that I use on my Sapphire for FMQ, so experiment with your machine to find what works best. 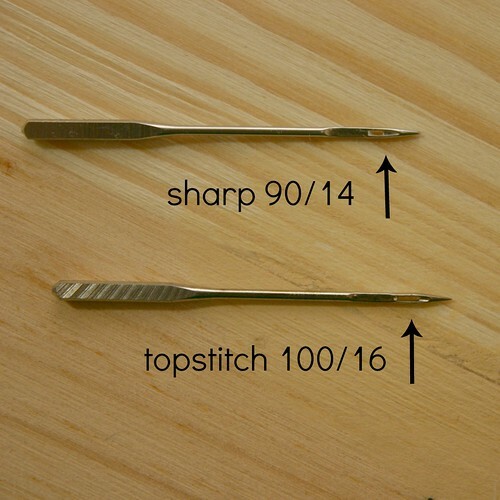 Bigger needles, in general, are more rigid and will resist bending, even when FMQ'ing, and the needle bending is what most often causes skipped stitches and broken threads. 6. Give it some gas. If your motor (and therefore your needle) is moving too slowly, it can create additional pressure on the needle, often causing thread breakage or skipped stitches. Try to keep your speed nice and even, at a medium to fast pace, to keep your stitches even and your needle nice and sturdy. 7. What kind of thread are you using? Some machines just don't like certain brands of thread. I've found so far that my Sapphire despises Superior threads and the Juki doesn't like Coats & Clark threads. Each machine is different, so try other brands. The one thread brand that I can't recall hearing anyone say their machine doesn't like is Aurifil, so you may want to give that a try. 8. Set your stitch length to zero. Many machines don't need this in order to FMQ properly, but if you're still having trouble after all of the other steps, give this a try. 9. Make sure your needle and foot are installed properly. Double-check that your needle is fully screwed in and that your free motion foot of choice is installed accurately. I once had a student using a spring-loaded open toe foot who had stitch problems until we realized that the needle rest was not sitting on the needle screw as it should be. Once we reinstalled the foot properly, all was well! 10. Try lowering your top thread tension. Is your top thread breaking? If you've already followed the steps above, it's possible your thread tension may be too tight. Try lowering the tension. If all else fails, take your machine in to a dealer for a full cleaning - it's possible that your machine may need to have the timing adjusted if all of these tips have failed you. Make sure to tell your dealer what's going wrong and what you've done to try to solve the problem.